The persecution in our days had been prolonged to the fifth year. And it was the month Nisan, and the second day of the same month, when a godly virgin, and holy in all things, one of the virgins of the Son of God in the city of Tyre, who was not yet eighteen years old, out of pure love for those, who on account of their confession of God were set before the tribunal of the governor, drew near and saluted them, and entreated them to remember her in their prayers: and because of these words which she had spoken to them, the wicked men were filled with anger, as if she had been doing something unjust and improper; and the officers seized her forthwith, and took her before the governor Urbanus, for he still held the power in Palestine. And I know not what happened to him, but immediately, like one much excited by this young woman, he was filled with rage and fury against her, and commanded the girl to offer sacrifice. And because he found, that although she was but a girl, she withstood the imperial orders like a heroine, then did this savage governor the more inflict tortures on her sides and on her breast with the cruel combs; and she was torn on the ribs until her bowels were seen. And because this girl had endured this severe punishment and the combs without a word, and still survived, he again commanded her to offer sacrifice. She then raised her lips and opened her eyes, and looking around with a joyful countenance in that time of her suffering, (for she was charming in beauty and in the appearance of her figure), with a loud voice she addressed the governor: "Why, oh man, do you deceive yourself, and not perceive that I have found the thing which I prayed to obtain at your hands? For I rejoice greatly in having been deemed worthy to be admitted to the participation of the sufferings of God's martyrs. Indeed, for this very cause, I stood up and spake with them, in order that by some means or other they might make me a sharer in their sufferings, so that I also might obtain a portion in the kingdom of heaven together with them, because so long as I had no share in their sufferings, I could not be a partaker with them in their salvation. Behold therefore now, how, on account of the future recompense, I stand at present before you with great exultation, because I have obtained the means of drawing near to my God, even before those just men, whom but a little while ago I entreated to intercede for me." Then that wicked judge, seeing that he became a laughingstock, and that his haughty threats were manifestly humbled before all those who were standing in his presence, did not venture to assail the girl again with great tortures like the former, but condemned her by the sentence which he passed to be thrown into the depths of the sea. And when he passed on from the condemnation of this pure girl, he proceeded to the rest of those confessors, on whose account this blessed maiden had been called to this grace, and they were all delivered over to the copper mines in Palestine, without his saying a word to them, or inflicting upon them any sufferings or torture; for this holy girl prevented all those confessors by her courageous conduct against error, and received in her own body, as it were on a shield, all the inflictions and tortures which were intended for them, having rebuked in her own person the enemy that opposed them; and subdued by her valor and patience the furious and cruel judge, and rendered that fierce governor like a coward with respect to the other confessors. It was on the first day of the week that these confessors were condemned in Caesarea; and in the month above written and in the year noted by us was this act accomplished. 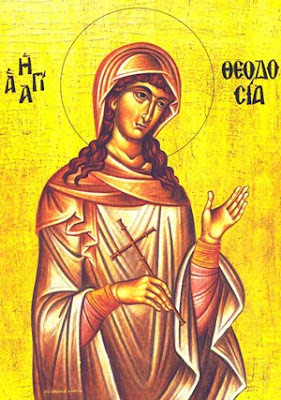 * On April 2nd she is known in the Synaxarion of Constantinople as Theodora, but Saint Nikodemos the Hagiorite tells us that the handwritten manuscripts name her Theodosia, and the brief life there resembles in every way with Theodosia commemorated on May 29th. 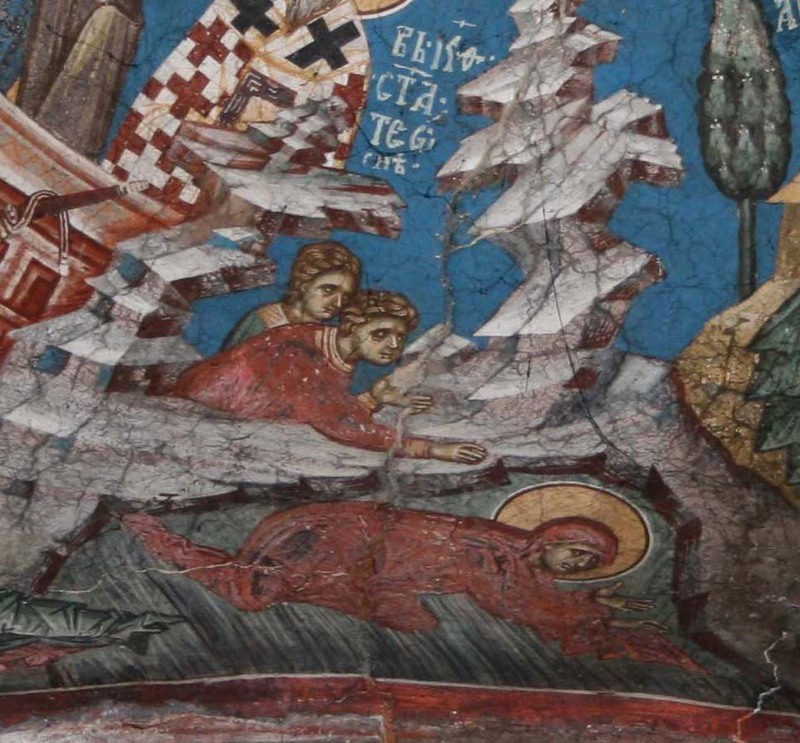 Thou wast betrothed to the King of Heaven, as a pure and trophy-bearing Virgin Martyr. 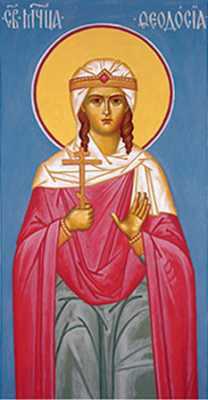 O praiseworthy Theodosia, entreat Him to save our souls.